Recently we recorded and watched beautiful and informative programme on BBC 2, Sacred Rivers with adventurer Simon Reeve. He explores parts of the globe which otherwise cannot be explained without gaining knowledge of the influences that their rivers brings. In the family everyone did get excited to watch second episode as Simon went to India, and he followed sacred water of Ganges from Source to sea and exploring how India's economy has effected it's religious culture, The programme showed how significant river Ganges is to the lives of the people, same time also reveals that the pollution has taken it's toll on the river and struggling under the pressure of modern India. Watching this particular episode took me back to the memory lane of my childhood,after watching places such as Rishikesh, Haridwar and Varanasi, thoughts and incidents came flooding in the mind of my visits there, suddenly there was a lot to talk to my kids of this past incidents. My daughter wished I had pictures and videos of those days, unfortunately such technology was not available during my childhood but I have a treasure of these wonderful times in my memory, which pops out anytime and anywhere ! How times have changed, that we have capable gadgets to record and cherish delightful memories. After watching the programme on the Ganges, husband played a dvd of our kids when they were babies, everything temporarily forgotten, this dvd took us back some years suddenly. It was such a joy to be refreshed by watching the tiny tots and this suddenly made me realise the value of preserving memories ! It was although shocking to see myself way back then, basically I was a big girl. Maybe following a good diet and discovering healthy recipes, I've manage to knock off those extra pounds by a delicious way !! It's my belief that if you want to maintain a healthy weight, do not need crash diets, with eating right and natural food and comfortable workouts, can achieve lasting weight loss successfully, and develop a healthier relationship with food. It is important to focus on the right nutrients and balanced diet ! 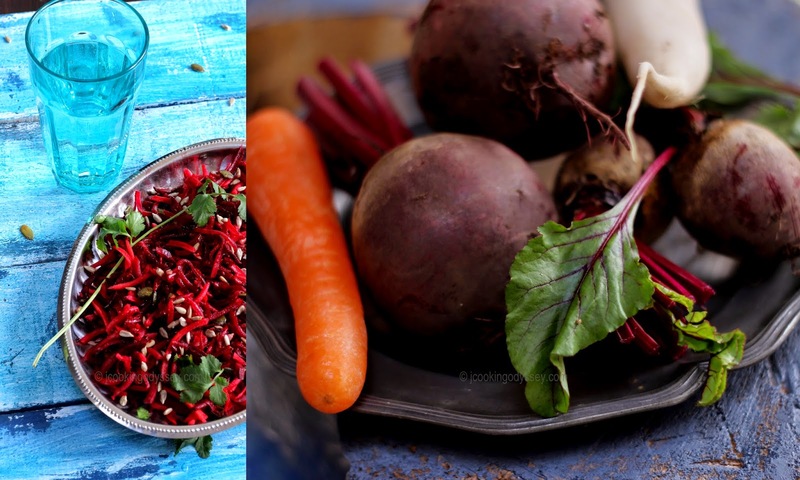 Since then I've tried and enjoyed so many nutritious yet flavourful recipes which are full of wonder food, one of them is Beetroot, Carrot and Mooli sambharo or warm salad. I've followed one of my other dish Gajar no sambharo ( carrot salad ) which was also a healthy option, but I've made further improvements by adding two specific vegetables and seeds. It is highly appreciated by the family members. Heat oil in wok or kadai. Add mustard seeds, when they splutter add hing and methi seeds. Keep heat on HIGH, add green chillies, grated beetroot, carrot and radish. Keep mixing and add salt. Stir fry mixture about 2 minutes. Turn off the heat, add lemon juice and mix. Garnish with a roasted seeds and fresh coriander. Serve with any meal or have on it's own. Very healthy.. I make it too. Protein Packed Granola - Full of Lucky Charms !